A tribute to the music of Freddie Phillips. In 1966, Gordon Murray asked Classical Guitar virtuoso Freddie Phillips to provide music and songs for his animated puppet children’s series, Camberwick Green. The result was an instant and huge success, with songs such as ‘Windy Miller’, ‘An Army Truck’ and the haunting credits theme passing into folklore. Murray and Phillips followed with Trumpton in ’67 and Chigley in ’68, giving us the world’s most famous fire crew (Pugh, Pugh, Barney McGrew, Cuthbert, Dibble and Grub) and a plethora of memorable melodies, such as ‘Time Goes By (When You’re The Driver of a Train)’ and the Trumpton Clock Tower Chimes. 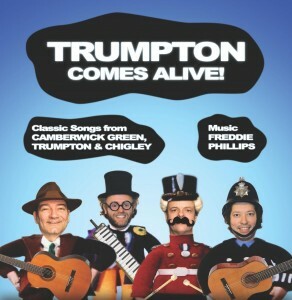 Still highly regarded by musicians in every genre, we pay tribute to the music of Freddie Phillips for the first time in Trumpton Comes Alive! Featuring the talents of internationally renowned musicians Adrian Oxaal and Stephen Wrigley (M.D. on the Sydney Opera House box-office record-breaker Lost and Found Orchestra), and with vocals and specially-written narration by acclaimed comedian and singer Glen Richardson, (star of Radio 2′s The Day The Music Died, who was recently hailed by The Times as one of the secrets of comedy), this is an ideal family show, perfectly suited to performance in even the smallest venues, and windmills and fire stations the length and breadth of Britain. Audience Comments – Trumpton Comes Alive!